Password Sync must be installed on every domain controller in the Active Directory domain in order to synchronize Windows passwords. The service synchronizes password changes made on Active Directory with the corresponding entries' passwords on the Directory Server. Like any Windows service, it can be modified, started and stopped, and uninstalled, depending on how synchronization between Directory Server and Active Directory changes. 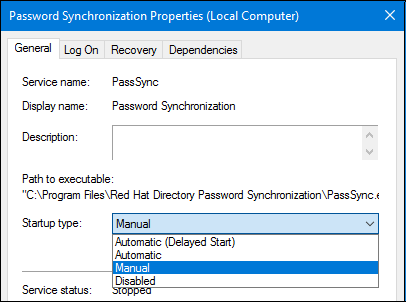 Select the Red Hat Directory Password Sync entry, and click the Change button to relaunch the installer to change the settings. Go back through the configuration screens to make any changes to the configuration. Double-click the Password Synchronization service. Select the Manual radio button, and click OK.
Right-click the Password Synchronization service. Changed passwords are captured even if the Password Synchronization service is not running. If Password Synchronization is restarted, the password changes are sent to Directory Server at the next synchronization. Select the Red Hat Directory Password Sync entry, and click the Uninstall button. If TLS was configured for the Password Sync, then the cert8.db and key3.db databases that were created were not removed when Password Sync was uninstalled. Delete these files by manually. For details, see the corresponding section in the Red Hat Directory Server Installation Guide.